The New York Rangers are shopping Mats Zuccarello. Zuccarello is scheduled to become a restricted free agent, coming off of a 1 year, 3.5 million dollar contract. It is believed that Zuccarello is looking for a long-term contract extension with the team between $5 and $5.5 million per year. If the Rangers plan on moving top-line right-wing Zuccarello, it would be strictly a money decision. Making it known that Zuccarello is available could be part of a negotiation ploy but as we have seen in the past Sather is not afraid to trade players that he cannot come to terms with. Katie Strang posted earlier today that by the looks of it, Mats Zuccarello will likely be traded than re-signed. Zuccarello has been fair in the past when it comes to contract negotiations, accepting one year deals at low costs. Rangers head coach Alain Vigneault has let it be known that he wants Zuccarello to stay in New York and why wouldn’t he as Zuccarello has contributed to much of the team’s success. AV repeats though what a big fan he is of Mats Zuccarello's game and that he is keeping his fingers crossed that Zucc stays in NY. Zuccarello is riding a 12 goal, 23 assist season. Clearly not a $5 million dollar season but he plays well aside Nash and Brassard. In my opinion, Zuccarello should be kept for the playoffs to keep the chemistry going. Risking him walking away after the playoffs sounds better than losing him prior to the playoffs as the Rangers would need a top-6 forward in return. 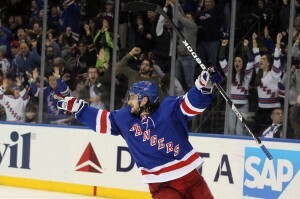 It’s clear that Zuccarello wants to stay and for the right price we can hope to see more of him as a Blueshirt.